Jean-Pierre Melville’s thus far “missing” 1959 feature Two Men in Manhattan. 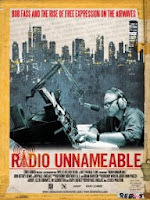 Radio Unnameable, the terrific documentary about NYC free-form radio legend Bob Fass. The Eclipse box Early Fassbinder, featuring five of the master’s early films. Armando Iannucci’s peerless political sitcom Thick of It: Seasons 1-4 (below) finally hits these shores. And Kidnapped, a taut thriller from the greatest Italian genre director, Mario Bava.